Greg Marchand cooked at London’s Mandarin Oriental, the Savoy Grill and the Electric House before joining Jamie Oliver’s Fifteen. It’s here that he was given the nickname ‘Frenchie’. In February 2016, he and his wife, Marie, launched Frenchie Covent Garden on Henrietta Street – their first site outside of Paris. The opening marks the fifth addition to the Frenchie family, which comprises the hugely popular Frenchie, Frenchie Wine Bar, Frenchie to Go and the Wine Shop, all on Rue du Nil, in Paris. Greg explains: “I love London and am so excited to feed on the energy, the diversity and the ‘richesse’ the city has to offer.” After almost a year of opening, Greg has rediscovered the best of British – both the produce and the people. 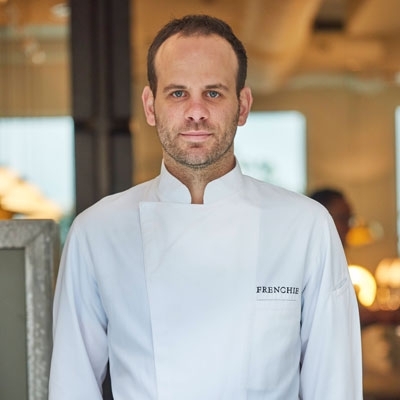 Greg believes cooking should bring joy and express care and passion – the opportunity to bring this philosophy to Frenchie’s wider community is extremely exciting. Greg and his team are ready for the £2 million challenge!